I thought baobab trees were something Antoine de Saint-Exupéry made up. I was about six years old at the time and also thought Antoine de Saint-Exupéry was a made-up name, embedded as it was in the confusing disconnect between the written and spoken versions of some alien language. Speaking very little English and absolutely no French, "Antoine" looked obviously like "Ahn-Toy-neh" to me except that the grown-ups kept saying something like Ant Wohn, with phlegm thrown in for emphasis. 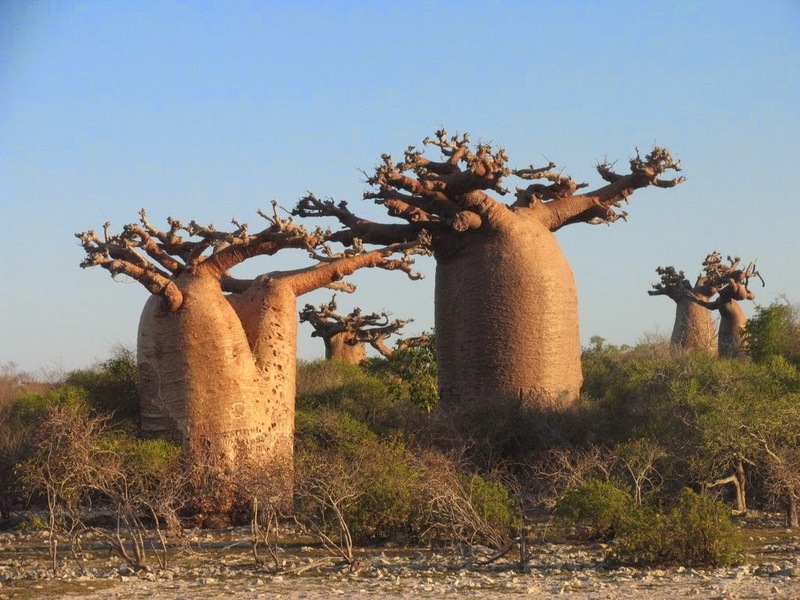 The idea of baobabs taking over entire planets left such a distinct imprint that it became one of those things in the universe that your brain randomly uses to juxtapose nearly anything. For example, streams of thought like "I'll stop there for a minute and get ice cream...can you juice a baobab fruit?" or "I wonder how that referendum in Scotland is going to turn out. Yet another place on the planet where baobabs can not grow.." And so on. Adeniums are not even remotely related to baobabs except in the most tenuous of senses (i.e. 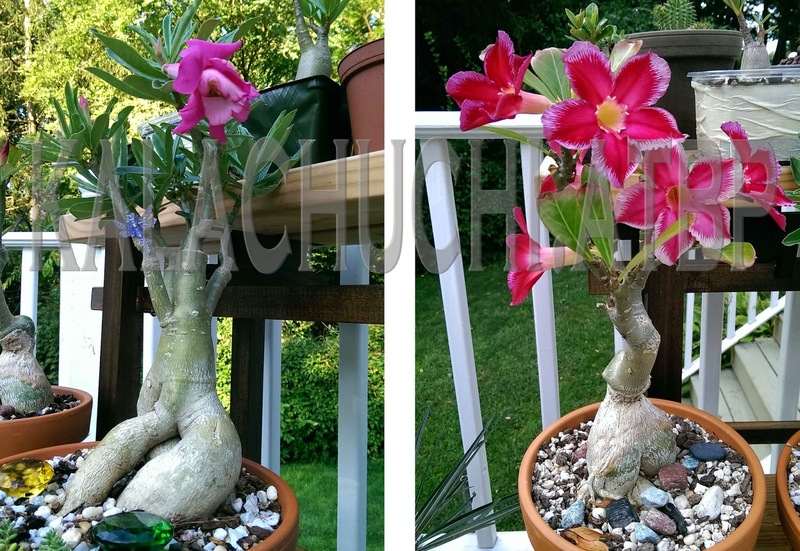 they are both photosynthesizing, flowering plants) but if you squint hard enough, it is possible for a well-shaped adenium to remind you of baobab trees for which you have no room in your yard, even if you could grow it. In that squint, you can also wonder about flocks of flying geese--a concept so alien it boggles the mind. In the Philippines, you see, geese do not fly. They guard your yard with the rambunctious zeal of a pack of dogs. Fiercely territorial, they would chase strangers away with their heads bobbing up and down from their long arching necks. It would look funny if they didn't move so fast and look so fierce. If they catch you, the experience of being "bit" by attacking geese could only be described as painful tickling. Again, this would be funny except for the fact that it actually does hurt. They are also so massive that they could knock you down. With three or four of them attacking all at once, who knows what could happen next. None of these things have anything to do with flowers in summer or moths pretending to be hummingbirds. It's just that baobabs, like fez, are cool. It is also entirely possible that baobabs are smaller on the outside. 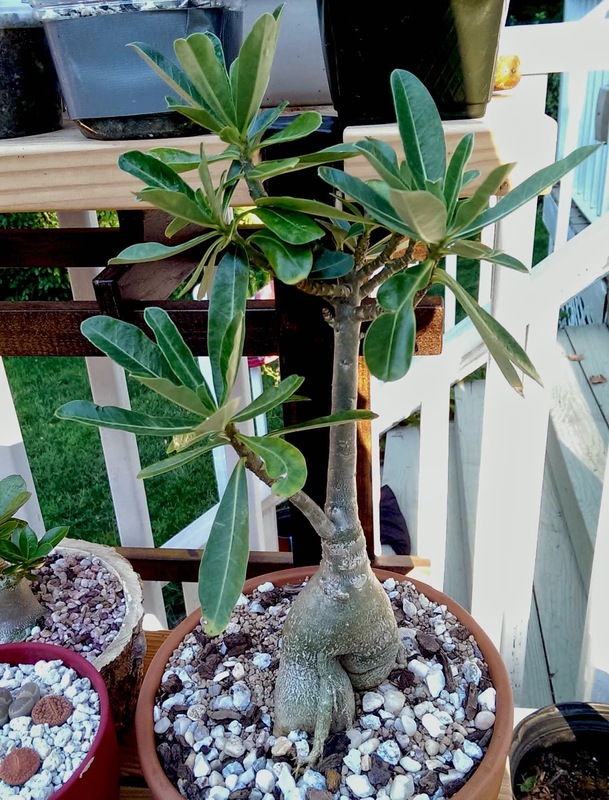 Attacking geese aside, the adenium/baobab illusion becomes thoroughly unsupportable because of the adenium's tendency to burst into a cacophony of loud floral extravaganza. Here you witness the difference between the heavy metal rock opera of the baobab and the musical drama of the adenium. I care very little for the flowers of this otherwise interesting plant but I welcome them nonetheless because their emergence is a statement about the overall health of the plant as a whole. Some plants bloom under stress but adeniums do so when they have energy to spare for seed production. This summer, my Rik Ni Ran put such a show that can only be described as classic opera. Starting with just one errant bud that dropped shortly before opening, it then produced more buds over a period of a month and then unfolded them all in the same week-long gala. You have to admit, its a fantastic look. It might just be this particular plant or it might be this specific cultivar but the Rik Ni Ran has always been the most sensitive to irregular feeding. It's a grafted plant, though. That makes it harder to predict what it will or will not like. 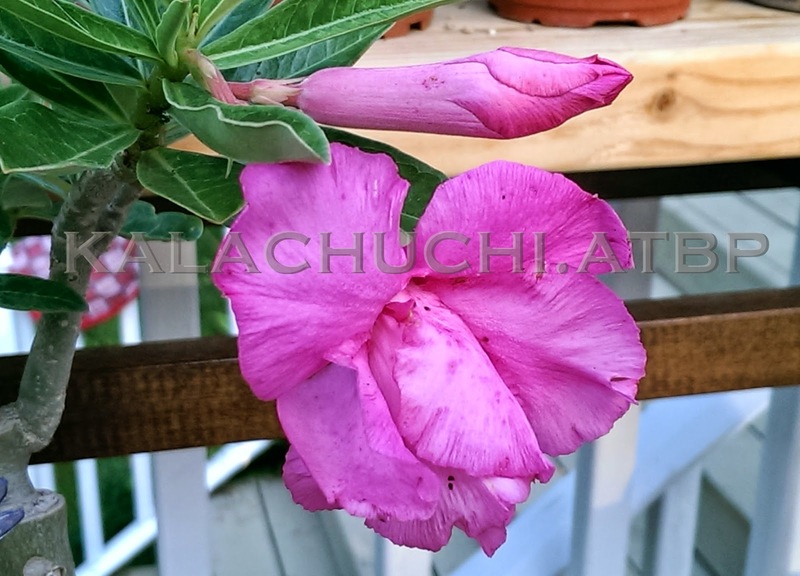 On the other hand, it is also the only plant in the collection that stayed in its 3-inch deep hypertufa pot. It is a particularly airy pot and that might have an effect on the ability of the gritty mix to retain moisture. After kicking off the season, the Rik Ni Ran was soon followed by the Hassadee Red which turned out to actually be Hassadee Pink. I hate pink. As you can see, this one looks like the underside of someone's petticoat. It's hard to see how any pollinator would go about sorting out this kind of flower. From a previous post, the plant on the lower right photograpg should be familiar--it's a rescue from one of those big box stores, found swimming on a tray of water. Its flower is slightly less offensive than the pink one. It's red with a jagged pink outline that looks kind of interesting. It's a single, thankfully. 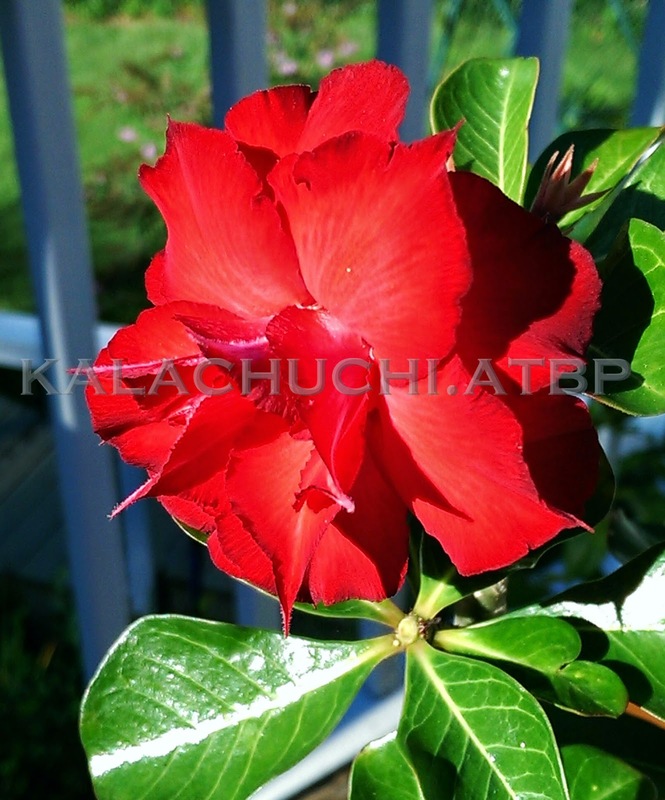 The two-toned petals really do not need further emphasis by layering them with gaudy ruffles. 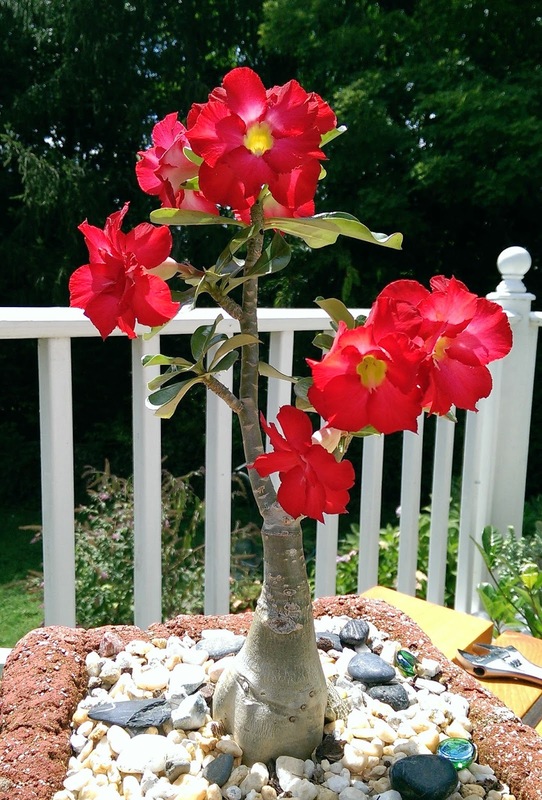 The tag on this plant only labeled it as "Red Desert Rose", a euphemism for "Desert Rose Whatever". So we'll name it something like Fear and Surprise or something. Like the Rik Ni Ran, Fear and Surprise started with one flower, paused for a month and resumed with this burst of buds. Also like the Rik Ni Ran, it is showing strains from the energy cost of this floral explosion, aggravated by neglect. Over the last two months, they have been strictly rain-fed as a result of the chaos that attended a change of address. Regular feeding and watering only just resumed and hopefully they will both recover, losing only the requisite number of old leaves that the plants normally lose while in bloom. The only adult plant that has not bloomed so far is the one below. It is supposed to bloom white. Right now it's just sitting there, taking up space with absolutely no hint of a plan to ever bloom. That's fine. It'll probably end up being pink anyway. Hate pink. All these plants in bloom have been subjected to about two months of erratic care; they have mostly been exclusively rain-fed, got no fertilizer and generally ignored. Think of these tips as the image developed from the negatives. 1. Shade or No Shade? Adeniums in bloom are best put in partial shade if you want to make the flowers last longer. In full sun about 8 hours a day, the flowers normally last about a week and a half. Then the oldest one will fall off. 2. Dead Leaves Sometimes a blooming adenium will also shed leaves, usually the oldest leaves (i.e. the ones closest to the roots) are the first to go. They turn yellow and fall off--this is quite normal. 3. Watering a Blooming Plant: Adeniums, it turns out, are less tolerant of erratic watering when they are busy producing flowers. They will do perfectly fine with whatever watering schedule you have so you do not have to water them more. What you can not do is break the watering cycle. They are more sensitive when blooming than they normally are. You may notice leaves turning brown and somewhat crispy at the tips. 4. Feeding Sometimes, when the energy expense of inflorescence is humongous and the plant is not supplemented with fertilizer, the leaves turn yellow at the tips (usually indicating some degree of malnourishment) or brown. If this happens to your blooming plant, just water it a bit more often and feed it weakly weekly. Again, you do not have to feed it more. Just don't stop feeding it at this very delicate time. 5. Pests Bloom time is a bug-busy time so you might also notice unfriendly ones wanting to take advantage of this largesse, You can spray a blooming plant with neem or horticultural oil if you have to. Just make sure you do it at dusk so it is not exposed to the sun while wet with insect-killing liquids. 6. Rain? Rain is good, we like rain. It is the most excellent way of slowing but thoroughly flushing out build-up in the soil of potted plants. That said, it will also melt your flower buds in a single day of non-stop downpour. If you have the patience, take your blooming plants to shelter. Wet. goopy adenium flowers are a bit sad as well as gross. It's hard to argue with anything that looks like this. 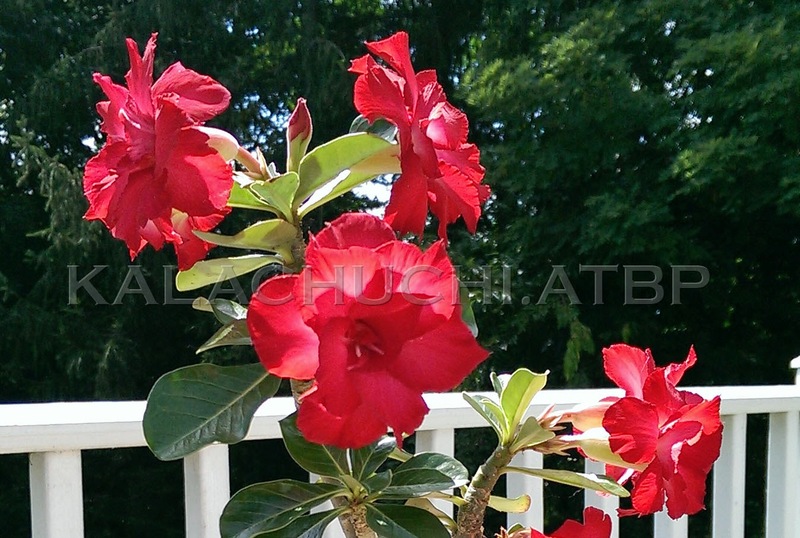 It's the Zoolander of adenium flowers. "I didn't invent the word itself, the teenage daughter of a colleague of mine did. He had said something he thought was rather important and profound and his daughter said oooh Dad said a deepity. A deepity is a proposition that seems to be profound because it is actually logically ill-formed. It has at least two readings and balances precariously between them. On one reading it is true but trivial, and on the other reading is false but would be earth-shaking if true. So you hear it, it seems true and then whoa! my gosh!..."